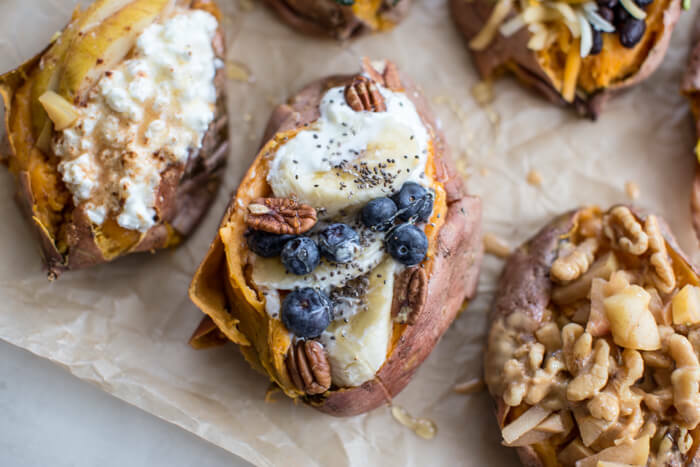 Calling all sweet potato lovers – these high protein breakfast sweet potatoes will undoubtedly be your new breakfast go-to! 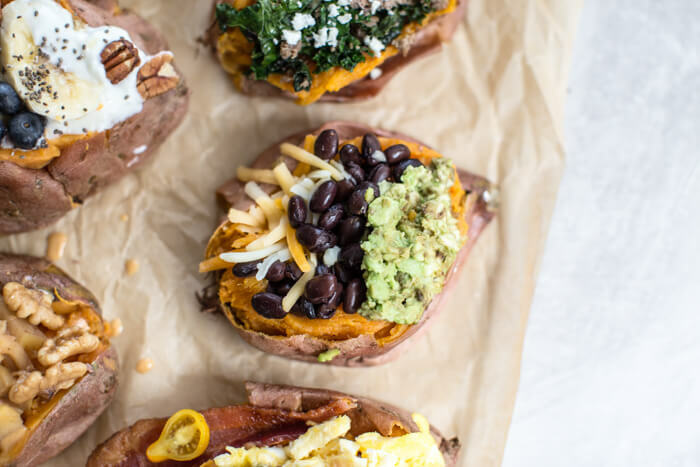 These recipes for high protein breakfast sweet potatoes may seem like simple combinations but the flavors are life-changing delicious. There’s a flavor combination for all taste buds out there– sweet and savory, dairy free, gluten free, meat lovers and vegan. 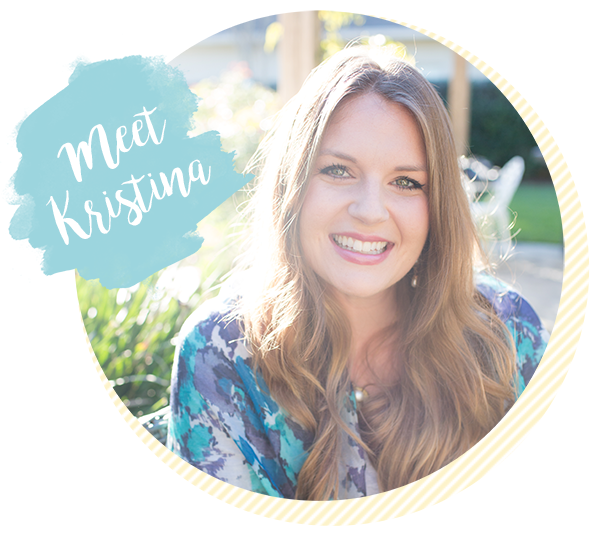 The possibilities are endless with sweet potatoes and because many of you went bonkers over the stuffed sweet potatoes I mentioned in my post about How to Feed Peanut Butter to Baby: 8 Ways on Early Introduction to Peanuts…. 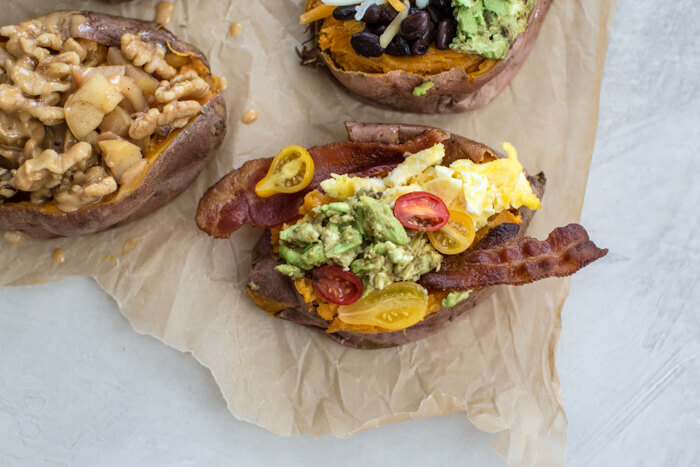 I’m back with more recipes on stuffed sweet potatoes – breakfast edition. I’m always trying to add more protein at breakfast time and these babies are the perfect way to do just that! 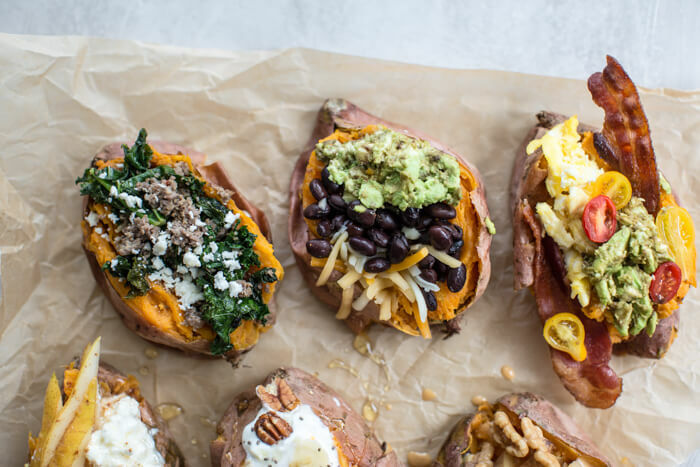 Not only do these stuffed sweet potatoes give your breakfast a nice boost in protein, they also provide excellent sources of vitamins and minerals such as vitamin A & C, fiber, manganese, and anti-inflammatory nutrients. 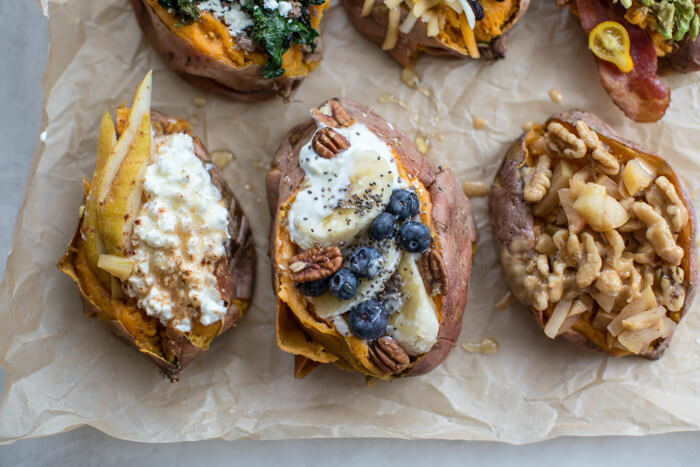 Change the breakfast game with these sweet and savory high protein breakfast sweet potatoes by trying a different flavor combination throughout the week. If you love stuffed sweet potatoes like me, you’ll never get tired of these. How to make sweet potatoes ON THE QUICK? Use the microwave. I like to make my sweet potatoes in the microwave! I often buy sweet potatoes in microwaveable bags, but if I have whole ones laying around, here’s my step-by-step process for microwaving a sweet potato. Wash sweet potato, poke several holes in potato and place in a microwave safe bowl or plate. Put sweet potato in the microwave on high for 5-8 minutes depending on size and cook until they are nice and soft! And that’s it– soft sweet potatoes reading for the fixings! Meat lovers rejoice. Stuffed sweet potato with scrambled or poached eggs, bacon, tomatoes, guacamole or smashed avo. A stuffed sweet potato with sautéed kale and breakfast sausage and finished with crumbled feta. A stuffed sweet potato that’s easy to make vegan if you opt for vegan cheese. This Mexican sweet potato is stuffed with eggs, black beans, cheese and avocado! Everything better with a little smashed avo. Cottage cheese for the win. 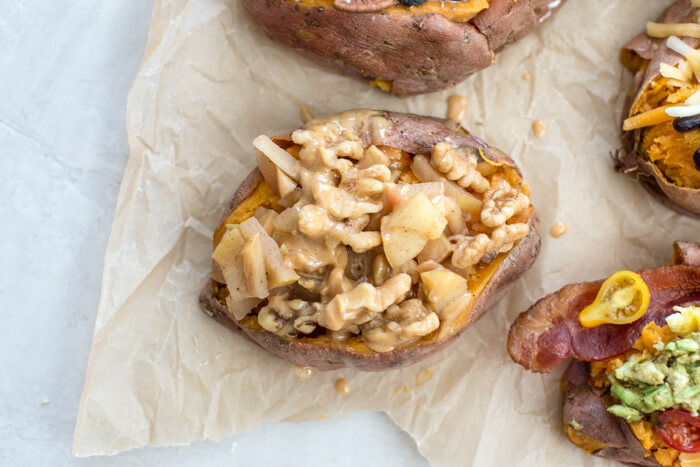 Protein packed and a little salty pears nicely (pun intended) in this stuffed sweet potato. Stuff with sliced pears and drizzle on a little honey and cinnamon. Cottage cheese is also a great source of high quality protein rich in leucine <— read more on that here. Maple syrup apples, need I say more? I diced up apples and added cinnamon sticks, a little maple syrup and splash of water and cooked the apples down a bit to make delicious maple cinnamon apples. Stuff cinnamon apples into a warm sweet potatoes with nut butter and walnuts and you’ll be so happy you did. You could also do shredded apples like I did in this Apple Pie Quinoa Breakfast Bowl. 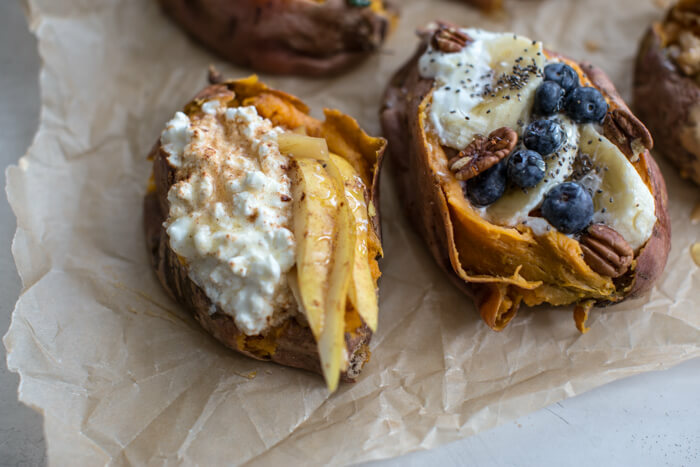 Ohhh, a little greek yogurt and bananas oh me oh my– this is my favorite stuffed sweet potato combo. This one is topped with chia seeds berries and toasted pecans. Just place pecans on a dry skillet and toast over low heat for a few minutes until pecans become slightly fragrant. Drizzle with a little honey too if you’d like some sweetness. 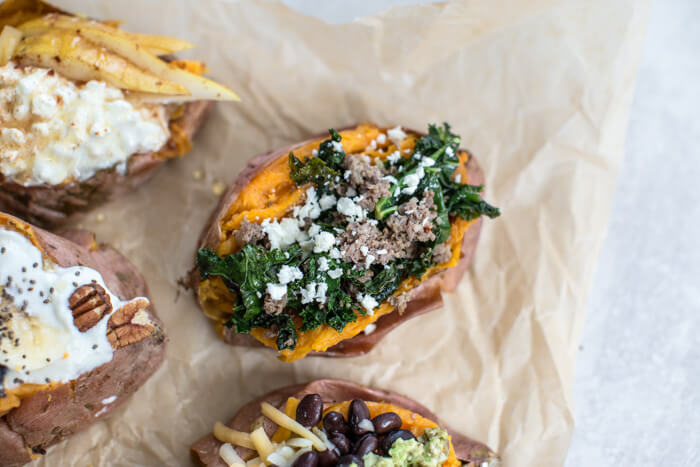 And TBH, there’s nothing like a warm stuffed sweet potatoes in the fall and winter months. I can assure you these high protein breakfast sweet potatoes will be on breakfast rotation in our home for the next few months! Oh and if you want to learn more on my take on how much protein you need head on over to my post on Leucine: Shedding Light on Protein Intake. 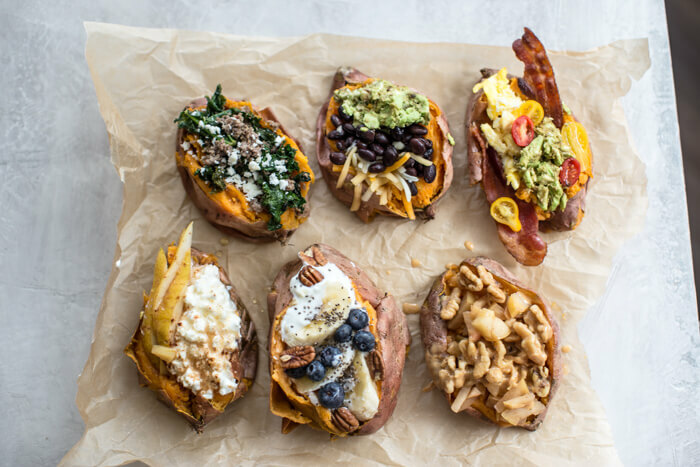 Let me know your favorite flavor combination for these High Protein Breakfast Sweet Potatoes in the comments on the blog! 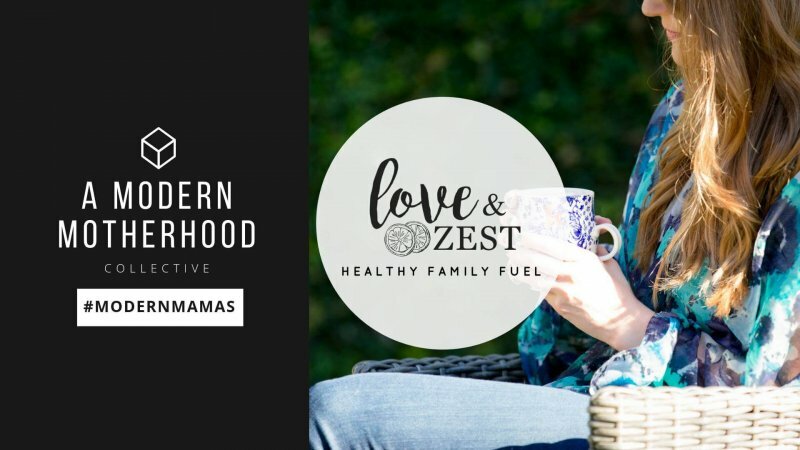 I’d also love to see your creations so be sure to tag me @loveandzest or #loveandzest.